He's in charge of the Annual Scarlet Monastery Blood Drive! I respectfully disagree. 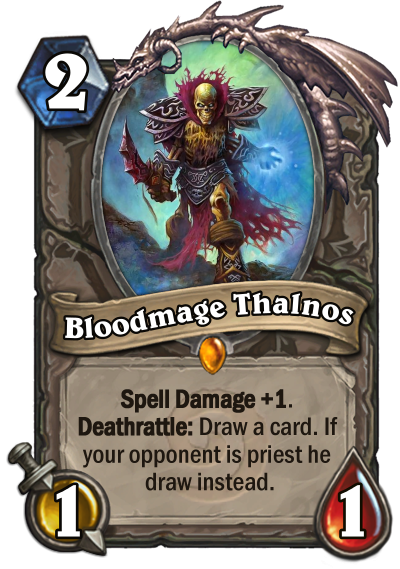 Yeah, Thalnos is good in a lot of situations, but he's not over-centralizing nor does he usually decide games just by being played, unlike Rag and Sylv. And unlike Azure Drake, Thalnos is limited to one per deck and has a lot more competition in the 2-slot than, say, Drake did in the 5-slot or Ragnaros in the 8-slot. Heck, a lot of deck archetypes today don't even run Thalnos because they can't free up a deck slot. GOLDEN BLOODMAGE THALNOS ENTRANCE ANIMATION! Crafted him a few days ago. I like this card. :-) Good in mage and deathrattle quest priest. I am a low ranking player (rank 9 at best) and still cant see the per-round SUSTAINABLE value in this card, other than with mage which I dont use. I do use warlock, hunter, druid and warrior though and warlock seems to be good enough with zealot. somebody knock some sense in please. Best neutral legendary now that Sylv/Rag are gone? Look at all of the common legendaries being played in this tournament. By sides this card not one single card is a True Neutral (minion that can be used in all classes). This was also the most commonly used legendary too. I sone of ther most used Legendaries. I fot in Druid, Rogue, Shaman, Mage, and Warlock mostly, it makes your damaging spell better and cycles itself. I crafted mine mine like a year ago and it wass worth it. After Deathwing makes a fiery appearance, Thalnos enters, poofing out more arcane dust than any other spell power minion in the game. After rotating out Rag And Sylvanas this guy currently is the best classic neutral legendary. Alright, so I oppened this guy up in my tavern brawl pack... first leg. in like 35 packs. I was so mad when I got him instead of Rag... so i almost dissenchanted him. But then I played him, and he was OKAY. Sorry, I am no pro-player, so can anyone explain to me why this guy is so good. Im sorry, you know, all of these comments say he's good, but is he really? Somebody PLZ explain. First of all, you can't get rag from packs anymore. 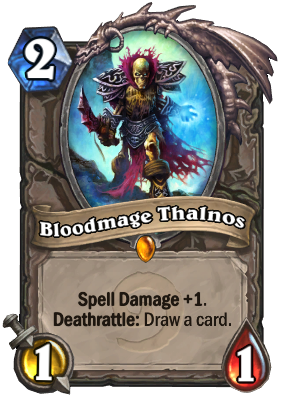 Second of all, thalnos has versatile and worthy stats to be in most decks, because spell damage makes up for the +1 attack loot hoarder has, as well as the deathrattle card draw. It's balanced because it trades stats for abilities. Well balanced card that fits the role of low mana legendary perfectly. Got him from a pack today, I am so glad I didn't have to craft him. Why can't he hold all these value?